I am a fan of informational maps. Here are two that put together this weekend. They are of the House and Senate Districts. 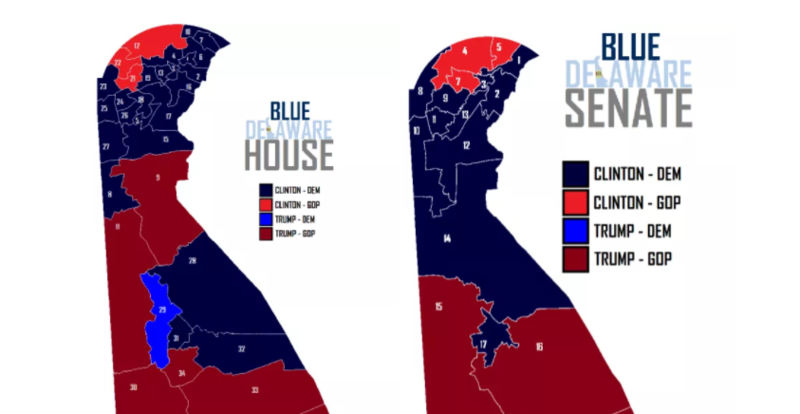 The Dark Blue Districts in both maps are those districts that have a Democratic Senator or Represenative, and also voted for Hillary Clinton in 2016. The Light Blue District, and there is only one of them, is where there is a Democratic Representative, namely Trey Paradee, but the district voted for the evil Donald Trump in 2016. The Dark Red Districts are where there are Republican Senators and Representatives and where they voted for Trump. The Light Red Districts are where there are Republican Representatives or Senators in districts that voted for Hillary Clinton. These maps highlight the main pick up opportunities in the coming two elections. Anthony Delcollo will have a huge fight to keep his 7th Senate District in 2020, an election year. So will Cathy Cloutier in the 5th SD, if she doesn’t retire. This map explains why the 4th SD and the 12th RD are prime and competitive pick up opportunities for Laura Sturgeon and Krista Griffiths or Rachel Blumenfeld. And it explains why Joe Miro is retiring and why Michael Ramone might be in trouble, no matter what happens at his pool. On the flip side, it explains why we might have some difficulty holding on the 29th as Trey Paradee seeks a promotion to the Senate, though a Democratic wave may save the seat for us this cycle. Well yes and no. Some Republicans when they look at maps like this and see lots of Red land say, see!!! We are the Majority. They forget that land doesn’t vote. The party needs to invest in Sussex and not cede it. There are some good candidates for House this cycle…let’s show them some support!